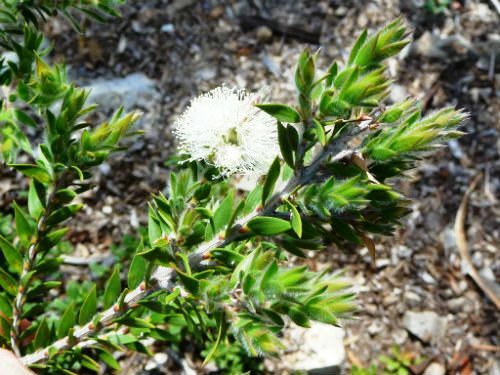 Melaleuca tortifolia is a tall shrub reaching a height of 4 metres. Bark is flaky. Leaves are 1.5 centimetres long, ovate to lanceolate, slightly twisted with a point. Flowers are carried in dense clusters, 2 centimetres long, white and sometimes pink. Blooms appear in spring. The flower heads are not as prominent as other Melaleucas. Perhaps this species could be grown as a foliage plant with the flowers as a bonus. The foliage is dense and would provide safe nesting sites for small native birds. M. tortifolia is extremely rare and is only known from a small area in New England National Park (NENP), northern NSW. The species was named in 1984 from material collected in NENP. The species name means twisted leaves. M. tortifolia, although rare in nature, propagates readily from both seed and cuttings.